Every so often you come across someone, [or a group of people], who are asking particularly pertinent questions. That’s exactly what attracted me to The Long Now Foundation, [which literally does what it says on the tin]. As a society here and now once meant this time, this decade, this era. Today here and now implies this particular moment. The challenge is if we’re all so busy living in the instant, when exactly do we consider the long-term and the long-term consequences of our actions? That’s why Stewart Brand [Yes, he’s most definitely a maverick,] and a few friends decided to challenge our thinking by creating The Long Now Foundation. Its mission – to foster long-term thinking and responsibility. The Foundation recognizes that many problems of a global magnitude can be traced back to a lack of long-term perspective. The purpose is to be an antithesis to today’s “faster and cheaper” mindset. To offer the lens of “slower and better,” which can help us as a society generate ideas and insights that will benefit society, not just now or tomorrow, but potentially in the next 10,000 years. A goal most definitely worth striving for. [For a better and more concise explanation explore The Long Now Foundation and in particular Michael Chabon’s article]. One of the ways The Long Now offers to help us to see the world through a different lens is through their Seminars. In July, the theme was Perspective and the guest George P. Schultz. Secretary Shultz was a US Marine Captain in World War II. After becoming an economics professor at MIT and the University of Chicago he served the Nixon administration as Secretary of Labor, then director of the Office of Management and Budget, then Secretary of the Treasury. Back in private life by 1974, he led Bechtel Group as Executive Vice President and President. He was appointed by President Reagan as Secretary of State in 1982, where he helped finesse Reagan’s relationship with Gorbachev that wound down the Cold War. 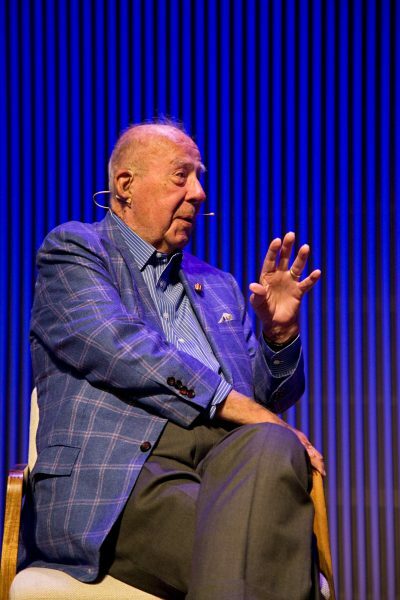 Still active in public policy after leaving government in 1989, Shultz has been an advocate for legalizing recreational drugs, for ending the Cuban embargo, for a world totally free of nuclear weapons, and for a revenue-neutral carbon tax. I figured, at 97 George Schutz might have a few things to teach me, and boy did he. Applicable to life and work whenever we experience challenges. Let your work and actions speak for you. Begin by understanding each other’s needs and strive to fulfill them. Our diversities are the gifts we bring to the table, we need to be open to diversity if we want a different contribution. Don’t just see the differences, value them. Diversity is exactly what helps us to think differently as a society. One size does not fit all. The solution needs to address the challenge; sometimes geographically. Often the solution is simple, yet simple can require more courage to do, listen to your heart. An instant carbon footprint reduction, resultant from the innovations that result from human creativity. Don’t put your head in the sand. Recognise YOUR responsibilities and do your part. Good business is one where both and/or all sides benefit [win-win-win]. Hindsight is great, this only works if we are open and reflective of the lessons our experiences teach us. Integrity – say what you mean and mean what you say. Be the person who’s handshake still stands for something. Hardly strange because those on a mission consistently outperform those without one, quite simply, their why is stronger. Failing is part of equipping them to win, just don’t set people up to fail. Win – Win -Win. Good for all concerned. Relationship-centered care was the way we worked on the paediatric units I worked on. How are you going to have good relationships without getting to know people? In everything we do in life relationship building is fundamental and essential. It’s why emotional intelligence is a powerful ally to IQ. Because we’re all here to serve other human beings in some capacity, aren’t we? George Schultz’ insights were powerful and made me think, reflect, connect and more importantly, apply them to my life and business. Thank You, George. If you would like, you can listen and watch George Schultz’ Seminar. And well my next question is, what resonates with you and why?